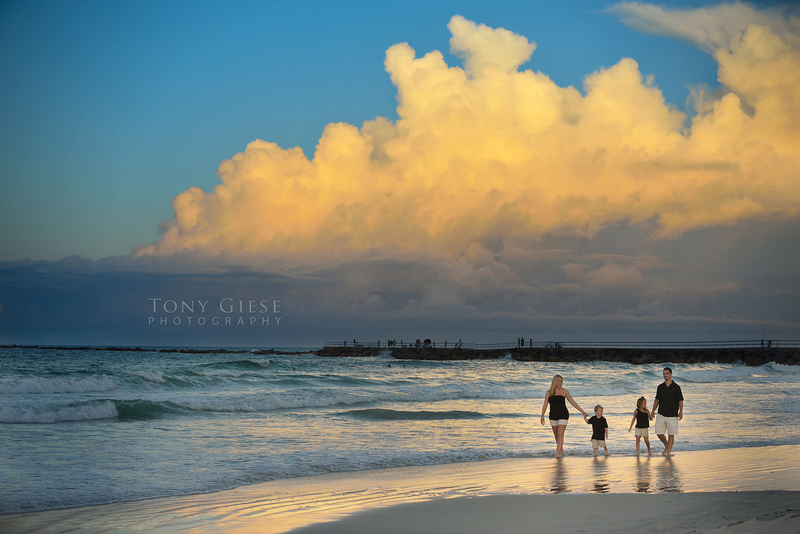 Daytona Beach, Florida makes for a beautiful background in your family beach portraits photographed by Tony Giese Photography. First we must decide whether it will be a morning, or evening, shoot. In the morning, the best time to our photography is around ten minutes before sunrise. Everyone needs to arrive early so that you’re on the beach ready to shoot when the sun breaches the horizon. Once the sun is up, you’ll have about one hour before it becomes too bright causing squinting in the eyes. In the evening, you will want to start approximately one hour before sunset. This produces portraits with a warm glow from the setting sun, and it will be less bright for your subjects to keep their eyes open. 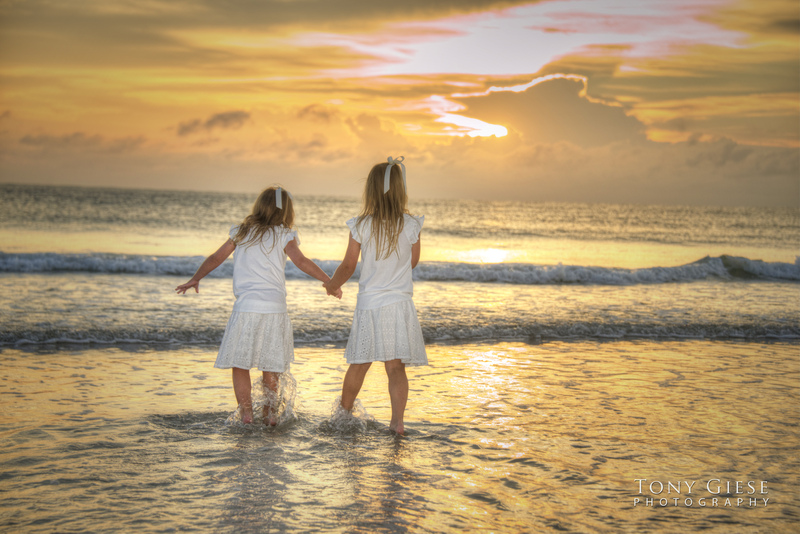 White attire blends well with Daytona Beach white sands helping create beautiful portraits. In planning for your family beach portrait session, its a good idea to photograph one full day after your arrival, this provides time to relax and get feel of the area. On the next day will be your session providing upon good weather, if not hopefully we can reschedule before your beach stay ends. Booking early will also help by not having any glowing red sunburn skin in your photographs. Suntans are nice but sunburns can be a disaster for portraits. For those persons with make-up, especially too heavily applied rouge is not recommended. It’s a good idea to bring a blotting towel or face powder to help dry perspiration therefore reducing unwanted shiny faces. Using a strong professional flash creates fill from shadows created by photographing into the morning sun at New Smyrna Beach, Florida. Most beautiful Daytona Beach portraits occur right before the sun comes out. 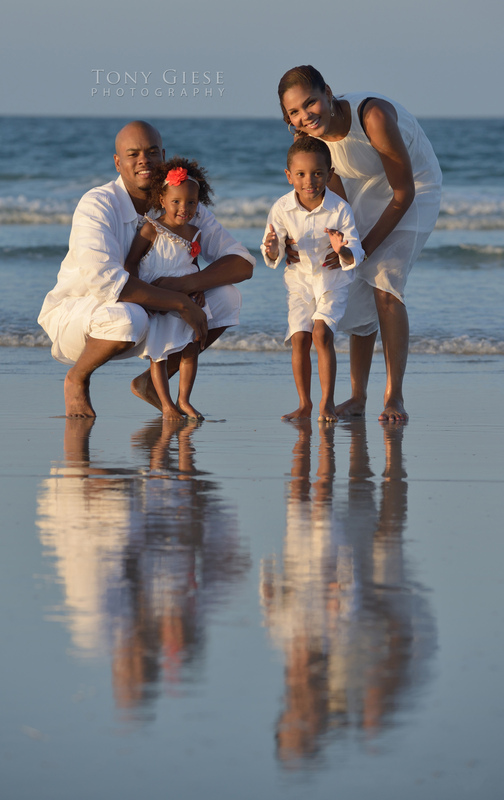 Most beach portraits are photographed with families wearing white, khaki, denim or pastel solid clothing. There is a reason for this: neutral earth tones work best. If you would like to incorporate some color try using blue, green, or black. Avoid busy loud patterns, stripes, plaids or bright colors because they make groups look to busy, cluttered and unprofessional. This is especially true when the sun provides a warm glow, for it will over-saturate the color of the clothing. The most beautiful portraits can occur right after a rain storm breaks and the sun comes out at Ponce Inlet beach. If you have a large group to photograph, we like to start with the entire group. Then break it down into individual families and finally the children alone. If grandparents are present, photograph them with all the kids. Very young children should have a nap before the session. We need to work fast getting those precious expressions from the children by producing the session as a rewarding fun adventure. 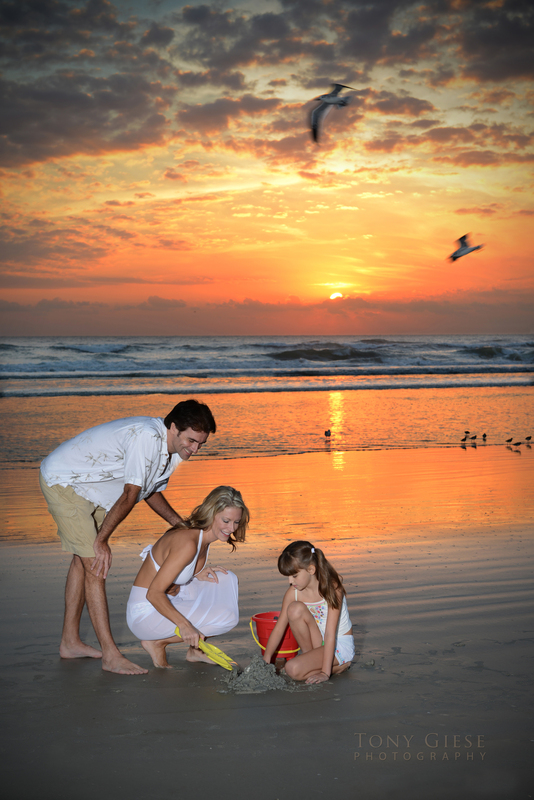 Side lit family portraits are a scenario of a Rembrandt on Daytona Beach, Florida. Don’t just have children stand there on Daytona Beach with their hands dangling at their sides. Have kids jump, walk, run, look at you, look away from you. Is your pet part of the family? If so, then we would love to have you pets photographed with you. 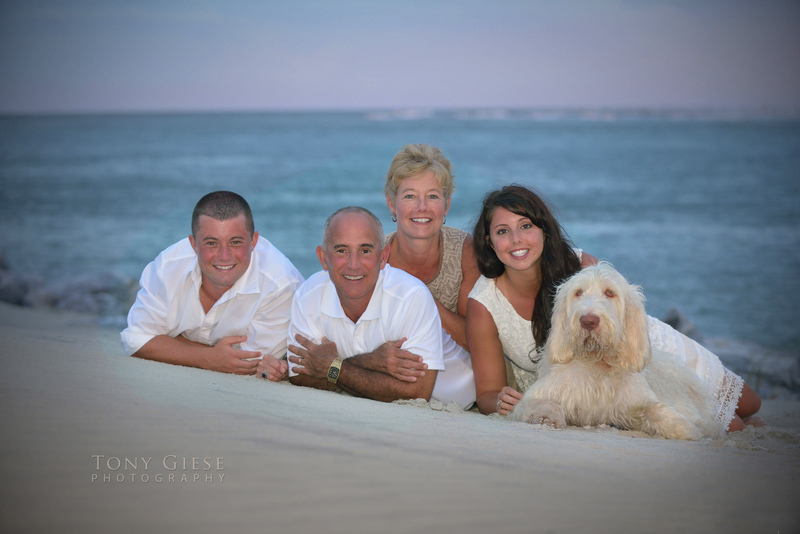 Family pets are a plus when included in portraits at Ponce Inlet beach, Florida. 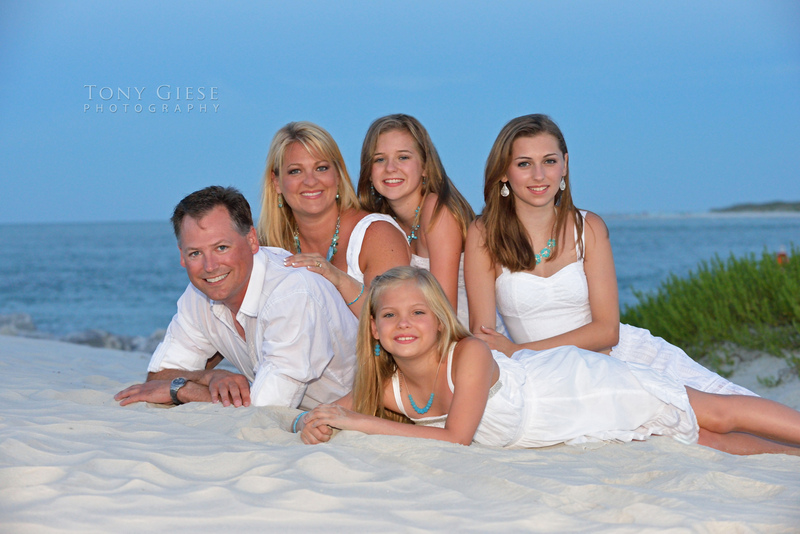 You can call or email Tony Giese Photography to lock in your beach portraits portraits on our calendar. We are always happy to answer any of your questions to make sure that you feel comfortable with us and that our work will best suite you. Early before sunrise taking advantage of the morning glow for silhouettes at Ponce Inlet Beach. 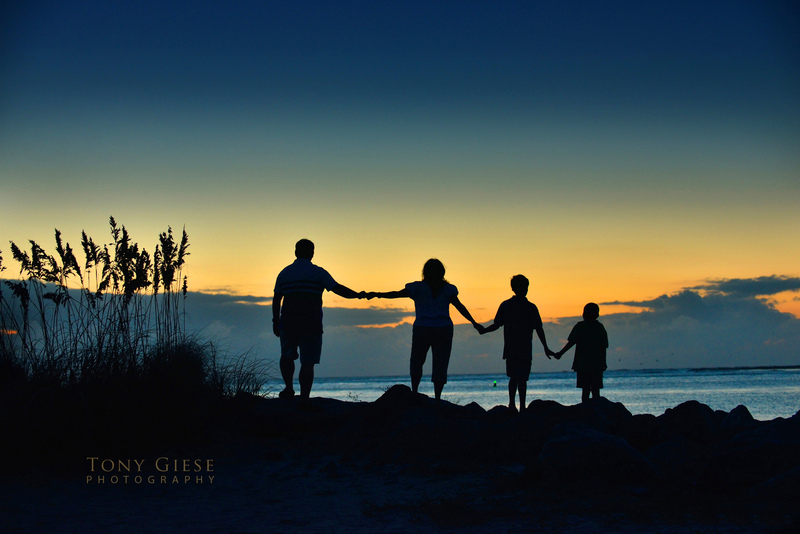 This entry was posted in My Posts and tagged Beach portraits, Children portraits, commercial photographer, creative photography, daytona beach, Daytona Beach photographer, Daytona Beach portraits, Family beach photos, family beach portrait, Florida, Florida Photographer, Florida Photography, photographing beach scenes, Tony Giese Photography. Bookmark the permalink.